1984-10-01. New. Ships with Tracking Number! INTERNATIONAL WORLDWIDE Shipping available. Buy with confidence, excellent customer service! 1984-10-01. Good. Ships with Tracking Number! INTERNATIONAL WORLDWIDE Shipping available. May not contain Access Codes or Supplements. May be ex-library. Shipping & Handling by region. Buy with confidence, excellent customer service! New York: Macmillan Publishing Company, 1984. Third Printing. Hardcover. Very good/very good. 195 pages. Index. Signed by the author. New York, NY: Simon & Schuster, 1984. Hardcover. Good/Very Good/Good. Type: Ex-Library This book is about the waste of your hard earned tax dollars. Macmillan Publishing Company, 1984-10-01. Unknown Binding. Used:Good. NEW YORK NY: MACMILLAN CO (THE). FINE IN FINE D.J.. 1984. HARDCOVER. ISBN: THIRD PRINTING. Keywords: POLITICS, INVISIBLE, ABCDEF. US: Macmillan Publishing Company. 0025449303 * Very good in Very good dust jacket. First Edition. books carefully packed and shipped promptly . Very Good. 1984. US: Macmillan Publishing Company. Hardcover. 0025449303 3rd printing. Some dust marks to fore-edge else very good in very good dust jacket. Signed by the author on the front free endpaper. * books carefully packed and shipped promptly . Very Good. 1984. Macmillan: Macmillan. 1984. paperback. B026052; 195 pp paperback, contents & wraps good . US: Macmillan Publishing Company. Hardcover. 0025449303 Very good in very good little nicked dust jacket. First edition * books carefully packed and shipped promptly . Very Good. 1984. Macmillan Publishing Company. 0025449303 Good in very good dust jacket. Underlining and marginalia. First edition * books carefully packed and shipped promptly . Good. Macmillan Publishing Company, October 1984. Mass Market Paperback . Used - Very Good. Slight wear. May have minor sticker residue or marks or writing. We try to ship every day so your book arrives quicker! We are a small independent book store in the Midwest so we thank you for the support. Satisfaction guaranteed in all transactions. Let us know what we can do to help! Macmillan Publishing Company, 1984-10-01. Good. New York, New York, U.S.A.: Macmillan Publishing Company, 1984. 1st Edition. Hardcover. Very Good/Very Good. First Edition per number line. Black boards with beige spine cloth in very good condition. Black lettering on spine. Text block clean and tight. DJ very good with only light shelf wear and one tiny chip at bottom of front flap fold. Macmillan Publishing Company. Used - Good. Good condition. Good dust jacket. Hardcover edition. Macmillan Publishing Company. Used - Very Good. Very Good condition. Mass Market Paperback edition. Short gifter's inscription on inside. NY: Macmillan Publishing Co., 1984. Jacket has light edgewear. Boards have minor shelfwear. Pages are clean, text has no markings, binding is sound. . Hard Cover. Good/Good. 8vo - 7¾" - 9¾" Tall. New York: Collier Harvard Classic. Good in Good+ dust jacket. 1984. Paperback. Macmillan Publishing Company. Used - Good. Ships from the UK. Former Library book. Shows some signs of wear, and may have some markings on the inside. 100% Money Back Guarantee. Your purchase also supports literacy charities. Macmillan Publishing Company. Used - Very Good. Ships from the UK. Former Library book. Great condition for a used book! Minimal wear. 100% Money Back Guarantee. Your purchase also supports literacy charities. New York: Macmillan Publishing Company, 1984. CT6 - A first edition hardcover book signed by the author in very good condition that has chipping on the spine and sides near it, some bumped corners, light rubbing, foxing, light discoloration and shelf wear with no dust jacket. 8.5"x5.75", 195 pages. Satisfaction Guaranteed.. Signed by Author. First Edition. Hard Cover. Very Good/No Jacket. 8vo - over 7¾" - 9¾" tall. New York, New York, U.S.A.: Macmillan Pub Co, 1984. Hard Cover. Very Good/Very Good. 8vo - over 7¾" - 9¾" tall. NY: The Macmillan Co., 1984. Jacket has light edgewear. Boards have minor shelfwear. Pages are clean, text has no markings, binding is sound. Prior owner embossment on title page. . Hard Cover. Very Good/Good. 8vo - 7¾" - 9¾" Tall. Ex Libris. New York, New York, U.S.A.: Macmillan Publishing Company. A Hard Back. 0025449303 As New . New. 1984. New York, New York: MacMillian Publishing Company, Inc., 1984 Book. Good +. Trade Paperback. Good + trade paperback. May be some rubbing, bumping or closed tears to edges and corners of the book. Overall in good reading condition..
NY: Macmillan Publishing Co, 1984. NON price-clipped dust jacket [$ 14.95] clean, crisp, colors bright, minor edge wear. Pages [195 including index] clean, unmarked, binding tight and square. Black boards, clean, tan cloth spine, black lettering, a little shelf wear at extremities. Media Mail, US Priority and some International shipping include free tracking information.. First Edition First Printing. Hard Cover. Near Fine/Near Fine. MacMillian Publishing Company, Inc.. PAPERBACK. B000QX50GK STATED FIRST PRINTING, APRIL, 1969. RUNS VERY GOOD, STORED CONDITION. READ ONCE. SMOOTH SPINE WITH NO READ LINES. CLEAN COVER AND INSIDE WITH MINIMAL WEAR. NICE COLOR AND NO RIPS. SINGLE OWNER COPY. NOT EX-LIBRARY OR A REMAINDER. NO NAMES OR MARKS. MINOR STORAGE FLAWS EDGES. VILLAGE IDIOT'S BOOKS HAS LEGENDARY SERVICE. OUR BOOKS ARE DESCRIBED. WHY SETTLE FOR LESS? 04 14 2009 PB-210 . Very Good. New York, NY, U.S.A.: Macmillan Publishing Company, Incorporated, 1984. First Paperback Printing. Mass Market Paperback. Good. Brief summary of content available upon request by e-mail. Scribner, 1984/10/01 00:00:00.000. Mass Market Paperback . Good. Grace,J. 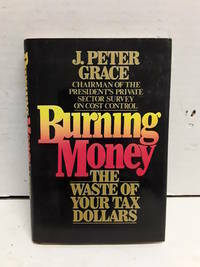 Peter Burning Money: The Waste Of Your Tax Dollars THIS IS A PAPERBACK NOT HARDCOVER !! Edge and corner wear. Creases to cover. Pages still clean and tight. All Orders Shipped With Tracking And Delivery Confirmation Numbers. New York, New York, U.S.A.: Macmillan Pub Co. Very Good. 1984. Paperback Pictorial. 0025449303 . 195 pages including index. the book is clean and without any marks. the waste of your tax dollars; 12mo - over 6¾" - 7¾" tall . New York, NY, U.S.A.: Macmillan Publishing Company, 1984. First Paperback Printing. Mass Market Paperback. Good +. Brief summary of content available on request by e-mail. Macmillan Publishing Company, 1984-10-01. Very Good. Signed by the author. Hardcover. Very Good in Very Good dust jacket. Clean, tight. Macmillan Publishing Company. 0025449303 Good condition but not perfect, Cover has minor nicks and tears, spine shows some creases from use. Ask Questions and request photos if your buying for the cover and not the content. STOCK PHOTOS MAY VARY FROM THE ACTUAL ITEM. ACTUAL PHOTOS AVAIL. UPON REQUEST. . Very Good. New York: Macmillan, 1984. Mass Market Paperback Mass Market Paperback. Used - Very Good. Macmillan Publishing Company. 0025449303 Macmillan paperback; no writing or tears; s . Fine. Old Tappan, NJ, U.S.A. : Macmillan Publishing Company, Incorporated, 1984. 0/0. 1984. Soft cover. 9780025449305 0/0 null 0025449303 null null This reprint paperback is very nice. 195 pages. No alien writing inside. Minor cover crease. .
Macmillan Publishing Company. 0025449303 Very Good Condition. Clean, tight and neat. Five star seller - Ships Quickly - Buy with confidence! . Very Good. Macmillan Publishing Company. Unknown Binding. POOR. Noticeably used book. Heavy wear to cover. Pages contain marginal notes, underlining, and or highlighting. Possible ex library copy, with all the markings/stickers of that library. Accessories such as CD, codes, toys, and dust jackets may not be included.